After five days in our new home town, we have made some observations. There is no structure what so ever as to how people move along sidewalks or underground walkways. Instead of all keeping to the right, the movements are completely random. A very interesting experience was today when, in an underground walkway, traffic shifted from left-hand to right-hand mid-tunnel. People are not walking, they are ambling along. Normally, there is a direct correlation between a city's size and how fast people are walking. This city is about seven times bigger than Stockholm, but the speed of walking is like in Skellefteå, population 32 000, on sunny Sunday afternoon. Beards are strange. At least full beards like Mats'. Children either look scared or point at it. Grown ups tend to look, but not more. Except a few, like the waiter that wished us Merry Christmas, or the cashier at the bread shop who could hardly contain herself from all the giggling. The apartment we have now, is only until end of September, so we need to get something else. 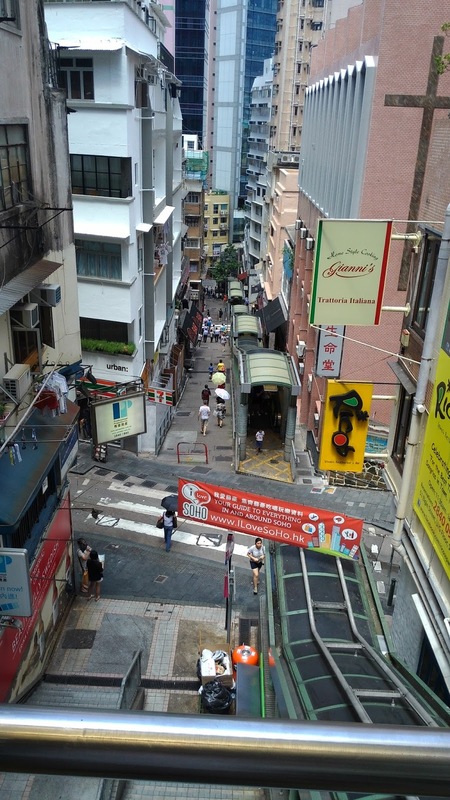 Causeway Bay is fascinating with all its shops, malls, and restaurants. But it is also crowded. Constantly. At first, we thought it was a Sunday phenomenon, but now we realize it is all days, all times. It is kind of cool to walk through these hordes now. In ten months time? Maybe not so much. 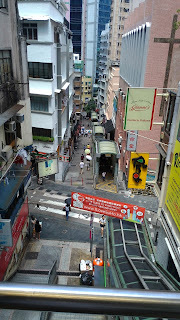 So we went to Central, up the Mid-Levels Escalator to a couple of addresses. It was an interesting experience when we had passed through SoHo (South of Hollywood, a bar and restaurant area halfway up the escalator): Everything got calm! It even got cooler! We will try to get something on Robinson Rd or Mosque St. Maybe. We also made a quick visit at the office. Looking forward to working there! Mats is making himself known: People stop and laugh, pointing at the beard. Or, as a waiter did, wishes us a Merry Christmas! Main part of our abode. Behind the wall is just room enough for the bed. We live at Time Square, in the middle of what seems to be a shopping area. There are shops and department store everywhere. Just across the road is a massive one with at least 14 floors, Lane Crawford. In the basement is what will be our local supermarket. 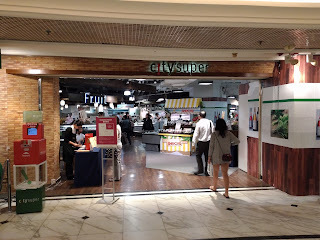 Our local supermarket, pretty upscale and not cheap. Dinner at Din Tai Fung, after dinner beer at East End Brewery. After a completely uneventful flight, we are finally in Hong Kong. Lovely Aily met us at the airport, with Erik and both daughters and gave us a silvery spoon to symbolize our birth as Hong Kong residents. A long cab ride later, we are settled in our home for the coming month. 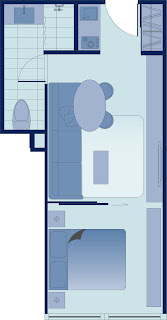 It is a very long time since we lived in such a tight quarters. Now it is time to get some food. At last we're on our way! I miscalculated the amount of baggage grossly, even with the brand new suitecase, I needed two extra bags. All in all almost 100 kg. Well below our allowance, but still impressive. Or scaring. Now we are in the Aurora lounge at Arlanda. Nice selection of beers: Melleruds Pilsner and Sleepy Bulldog, both on tap. With just over a week until we go, we had some colleagues over for pizzas and beer. Or maybe beer and pizza. Kind of a so long, and thanks for all the fish, but not so definite. We know there are a lot of very nice and socially competent people at the Hong Kong office, too, but even so we will miss our Stockholm friends and colleagues. They had better arrange a dev fest in Honkers this winter! Still haven't started packing. The infrastructure is ready to switch off and pack, and that is the main thing. We must have everything up and running and be connected first thing we arrive! Priorities are important! We are both big city people, preferring to live in the city and to go to cities on vacations. We both love big cities like London and New York. For a long time, San Francisco was our absolute favorite, having been there a number of times in the eighties and nineties, much because of it being a cultural melting pot where everyone is accepted. There is an air of tolerance that permeates the entire city that we really appreciate. In 2006, we came to Kuala Lumpur on our first trip backpacking in Southeast Asia. KL is also a big city with a very diverse ethnicity; Malays, Indians, Chinese, Arabs, and others, live side by side in tolerance. Another factor making KL our favorite city is all the good and exciting food! Plus, of course, very friendly people. Early 2011, I went to Hong Kong the first time. Visited ORC's Hong Kong office to spread the gospel of performance testing. Hong Kong almost instantly dethroned KL. It is a cultural melting pot of epic proportions. Its architecture is breathtaking with 40+ story high-rises with a-room-and-a-half footprint next to shacks. 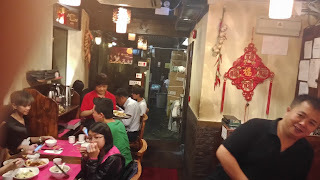 The food is so diverse with all the Chinese cuisines, all of the rest of Asia (even found a Nepalese restaurant! ), and of course the ubiquitous European and American restaurant (which I avoided). And all the people filling the streets, the sidewalks, and the walkways! 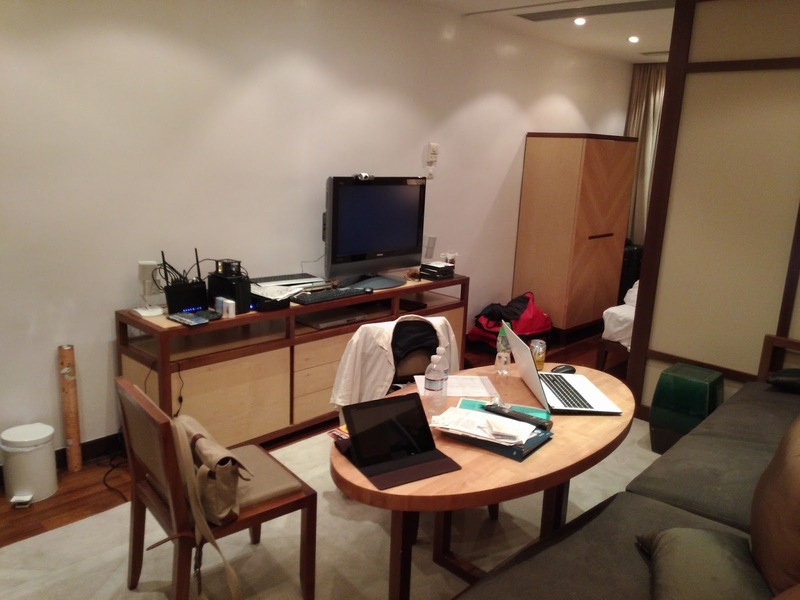 When home again, I started a campaign with the goal of going to Hong Kong with Yvonne on a vacation. In September the goal was reached as we landed on Hong Kong International. I was somewhat wary that I might have over-sold it, but my fears came to rest at once: Yvonne loved Hong Kong as much as I do! But everything is not due to Hong Kong's virtues, our friends Aily and Erik (Erik is a colleague of ours) helped making us feel both welcomed and special. We hope to repay them when they, in a few years, move to Sweden. There are tons of things to prepare before moving to another country. We need visas with working permit, someplace to live, browse the market for a decent bank and a good mobile phone operator. And we need to decide what to do with our Stockholm apartment while away. Luckily, we have the fantastic Joanne at the Hong Kong office helping us with the visas. She will also set us up with someplace to live the first month. The Internet is invaluable, too. We can sit at home, browsing the markets, looking for deals, making lists of which banks look good and so on.